Paris in the mid-18th century was a time of invention in the culinary arts. Food was an integral part of the fashion and culture of this bustling city. Haute cuisine has its foundations in this time and place. So for us at the Getty Center Restaurant—executive chef Mayet Cristobal, me as general manager, and the rest of our team—the chance to pair culinary experiences with the exhibition Paris: Life & Luxury, which tells the story of luxurious living in the Paris of the mid-to-late 1700s, is a dream come true. For inspiration, Chef Mayet hit the books, literally. François Pierre de la Varenne is credited with the first French cookbook—one that sparked a culinary revolution, transporting French gastronomy into the modern era. 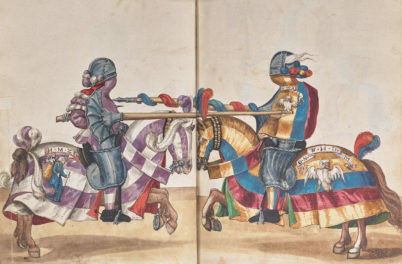 The heavily spiced flavors from the cuisine of the Middle Ages were abandoned, and foods’ natural flavors were prized. Exotic spices were replaced by local herbs. Vegetables like cauliflower, asparagus, peas, cucumber, and artichoke were introduced. Special care was given to the cooking of meat in order to conserve maximum flavor. Vegetables had to be fresh and tender. Fish, with the improvement of transportation, had to be impeccably fresh. 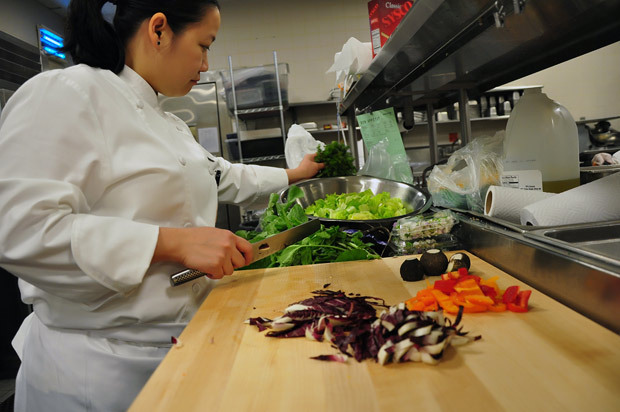 These revolutionary ideas are the basis for the techniques used by our cooking team at the Getty Center every day, where we are proud to bring you culinary creations rich with fresh, local, sustainably grown ingredients. For the run of Paris: Life & Luxury, we’ve developed a special Restaurant menu that combines recipes from the past with today’s cooking techniques, including a Vichyssoise, a traditional potato soup customarily served in a sterling silver soup tureen such as those found in the exhibition. The lunch menu is served Tuesday through Saturday (we have a special brunch on Sundays). 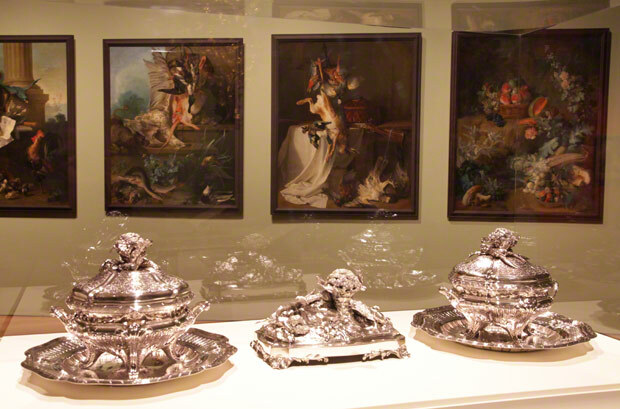 View of Paris: Life & Luxury: silver tureens and centerpiece by François-Thomas Germain from the J. Paul Getty Museum\’s collection; culinary still lifes by Jean-Baptiste Oudry on loan from the Nationalmuseum, Stockholm, hang nearby. After meeting with the curator of the exhibition, Charissa Bremer-David, we were inspired to add a bit more luxury with the addition of truffles and Dungeness crab for dinner, offered on Saturday evenings. See the dinner menu here, and the lunch menu here. 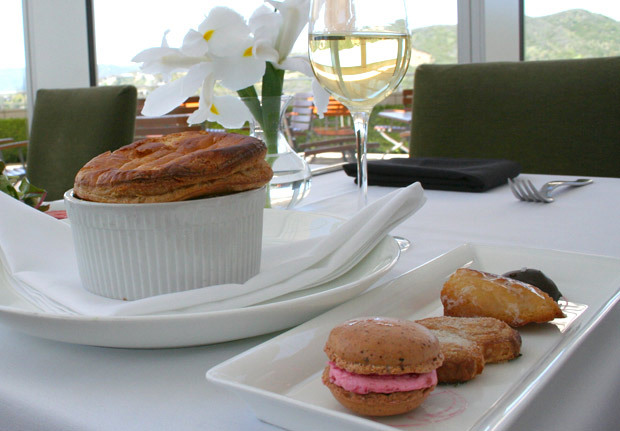 After you step into the artistic world of late 18th-century Paris in the galleries, come dine like a Parisian—albeit with panoramic views of the Pacific Ocean and the Santa Monica Mountains. Not enough time for a decadent Rococo meal? Stop by the Cafe to pick up a “Pique-nique”— a picnic box with a sandwich (jambon and gruyere on French baguette); olive, tomato, and cucumber salad; cheese and fruit; and a chocolate-dipped madeleine. If you’ve tried our Restaurant menu or pique-nique, we’d love to hear your thoughts about it, and hear what other artistic visions you’d like to see (and eat) in food form. 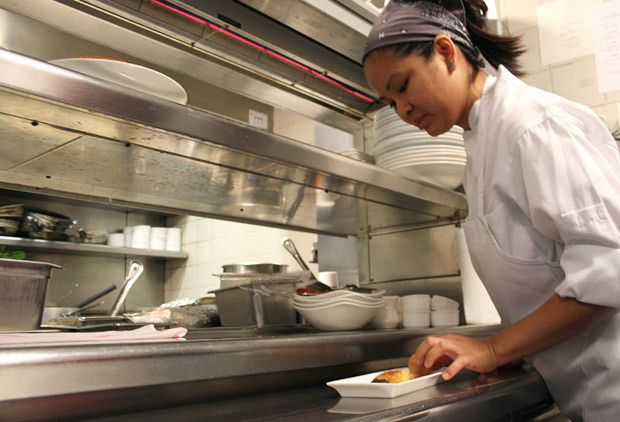 As general manager of food services at the Getty Center and the Getty Villa, I have the opportunity to blend my passions for food and art on a daily basis. I spent my younger years studying European art history in Switzerland. I started at the Villa six years ago and have loved creating culinary experiences for our visitors at both sites. I realized this has nothing to do with 21st century food preparation at The Getty, (delicious I say) but I can only wonder what public food conditions, and preparation was like for the cultured, fashionable, and hip in mid-18th century Paris. Hi Jay – Thanks for the question about the dates. The show is on through August 7, 2011. We’ll have someone contact you. I’m sorry I have to tell you that my experience at the Getty restaurant was far from memorable. I was quite excited to read about ‘Dine like a Parisian’ on your website. The photos of the salad and the chicken pot pie with puff pastry looked delectable. I had made a reservation earlier that week for Thursday June 9 at 1pm. I thoroughly enjoyed the ‘Paris: LIfe and Luxury’ exhibit! After the exhibit it was time to go to the restaurant. Once my eating companion and I were seated a lovely waitress, Arianne (sp? ), came by and we immediately told her that we were there to ‘Dine like a Parisian’ with the wine parings. We were looking to spend an enjoyable time eating a lovely French inspired meal. The salade de fraise was excellent. 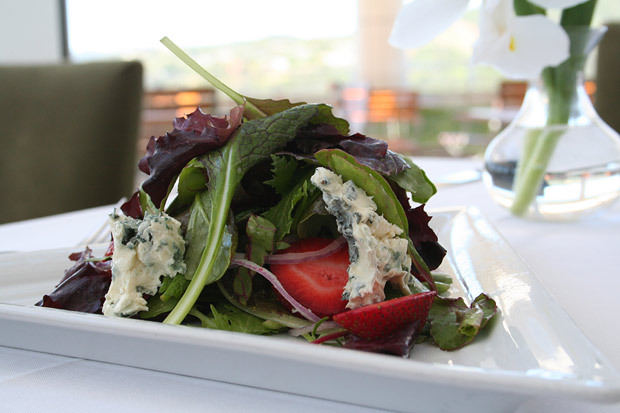 The strawberries were perfectly ripe with deep flavor and was balanced well with the dressing and the St. Agur blue cheese. The rosé paired well especially with the dressing. We were not even half way through our salads when a server brings out our pot pies. Even though I could smell the truffles wafting from the ramekins (which were making me drool), I informed the server that we were not ready for our second course. He was polite and took them back to the kitchen. We continued our salad and after two more bites, maybe 3 minutes later, another server tries to put down the pot pies again in front of us! I told him to please take those off the table and take them back to the kitchen. Truly we were just half way through our salads and our rosé! Hello? This is about 1:20 pm so it was not your closing time! Why were they in such a rush? I then see the waitress by our table and explained that we were far from finished with our salads and please tell the servers to not push the second course on us until we had finished our salads and rosé. She expressed amazement and completely understood and said she would take care of the situation then immediately proceeds to put down in front of us the second pairing of wines that are supposed to be served with the pot pies!! I just shook my head as she left thinking she was absolutely clueless. So it gets better. 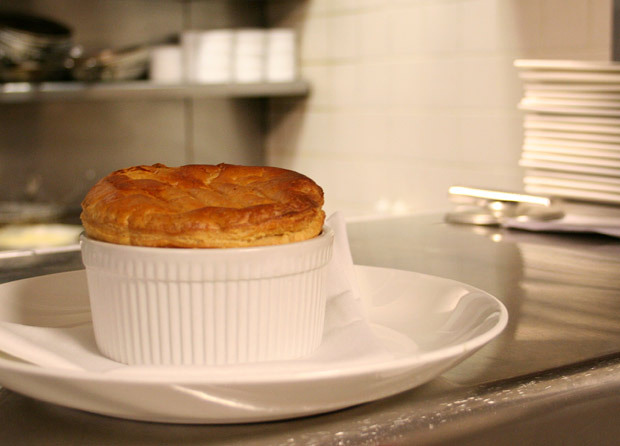 We finish our salads and rosé, the servers clear our plates and rosé wine glasses and then bring out our pot pies. They truffles smelled marvelous. I love truffles and even though these must be ‘summer truffles’ they still should have some flavor. I have been three truffle hunts in the Piedmont region of Italy over the years. I’ve have had truffles every way possible. Well, my first shock was visual. It was the lack of a puff pastry shell on top of the ramekin? It was shown in your review on the website as having a puff pastry shell in the photo. But, okay, I was game to try this lattice pastry topping. Well, has ANYONE in the kitchen tried this new topping? It’s impossible to dissect! And it’s not puff pastry but bread! And a very tough bread that requires a knife to cut apart. Really it’s like a losing battle of tug-of-war! It’s truly impossible to eat without making a mess. It turned into a ‘taffy pull’ to get beyond it. Just not right at all. I asked the waitress what happened to the puff pastry top that was shown in the photo. She explained that they used the puff pastry topping only the first week and she didn’t know why it was changed. I must admit the pea tendrils on the top were not only a visually beautiful touch but tasted great, too. Okay, now I finally dig in to the scrumptious filling and after the first bite both my dining companion and I stared at each other in shock. It was so overly salted that it tasted like a gooey salt lick coated with rosemary. After two bites we could not continued. Clearly someone in the kitchen accidentally spilled the salt shaker into the pie filling. Completely inedible. This meal and service is not becoming an enjoyable time to say the least. I signaled our waitress. Now I really DO NOT like to criticize over and over. Even though it sounds like I do but I really I do not! It’s a waste of time and when this kind of poor service and food happens I usually let it go but here we are supposedly having the very special ‘Dine like a Parisian’ and it’s more like ‘Dine like you’re in some place where people who serve and cook don’t care’. So I explain and actually apologize to our waitress that I really don’t complain like this at all but this is just getting absurd. I explained that it was overly salted and she said she would have the chef ( she referred to the chef as being a male that day) would make up a new batch. A few minutes later she comes back with two new pot pies. We ate the lovely pea shoots and tendrils and then refusing to go through the fight of trying to get through the silly tough bread topping we gently lifted it off the pie and laid it on the plate. Well, unfortunately this time the chef refused to put any salt in it at all. Definitely a miscommunication between wait staff and chef. We told the waitress it was overly salted not that we can’t have a correct amount of salt added. There was not salt on the table but at this point I was so disappointed and just wanted to get through ant out of there. I was not going to say anymore. It was ridiculous. But I did want to walk into that kitchen and tell the chef to NOT USE ROSEMARY when you use truffles!! Truffles are one of the most wonderful delicate fungus in the world. Any chef knows that using something so strongly aromatic like rosemary would completely overpower the wonderful delicate flavor. So as far as I am concerned this meal was a catastrophe. Wait. I am wrong. The pastry chef did an admirable job. But whoever was the chef that day needs to be instructed or overseen by Chef Mayet. It reflects on her. I’m sure she would not allow a dish such as we tried to eat through any dining room door. An embarrassment on the chef’s part. And here’s one more thing. On the downloaded lunch menu for this pot pie the ingredients are shown as ‘Truffle, Morel Mushroom, English Pea and Foie Gras’. Foie Gras! There was no foie gras. So please rewrite your downloadable lunch menu without using the word ‘foie gras’. And while you’re at it please add ‘strawberries’ as one of your ingredients in the salade de fraise. Whoever proof reads should be fired. Someone is definitely not proof reading. I’m sorry but after this experience I can no longer take friends or clients to your restaurant. It’s truly an embarrassment. Next time lunch will be at Bouchon. Thank you for taking the time to write this thoughtful note. My name is Heather Ogg and I am the General Manager for Food Services at the Getty. Chef Mayet and I have discussed your experience and we apologize for not meeting your expectations. We obviously had some kitchen as well as service issues during your visit and we have since addressed these issues with our team. We are very proud of our menu for this exhibit and would like the opportunity to try again with you and a guest. We’d be happy to make a reservation for a complimentary lunch at your convenience. We look forward to seeing you in the near future. We made reservations for a Father’s Day lunch, thinking that we were going to enjoy a special Parisian 18th century exprience with my in-laws and family. When we were finally seated, some time after our reservation time, we were told that there was no Parisian special lunch menu on Sundays. This fact was not apparent to me when I made the reservations on the Getty web site, and is not apparent to me today as I just looked again at the menus and web site. This should be more prominent in your web site. 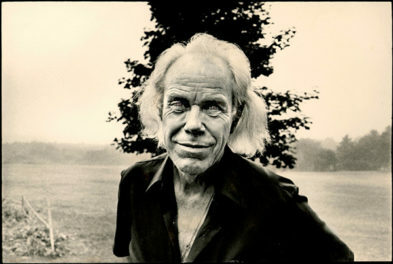 We made the best of it, even though we had come for this express purpose, and driven some distance. Overall, I’d say the food was good but ordinary, the service was slow and lacking, and the overall experience was disppointing. Hi James, Thanks for taking the time to comment and share your experience. As the web editor in charge of making sure content on our visit section is up-to-date and error-free, I apologize for this oversight — we should have stated that we have a brunch menu on Sundays. I’ll update the blog post as well as the information on our “Paris: Life & Luxury” exhibition page. I am coming to the Getty on Saturday July 30. I so much wanted my mother and me to enjoy your ‘Dine like a Parisian’ luncheon….however, after reading the reviews above……I hesitant. What do you suggest? There are no ‘good reviews’ related to this ‘particular dining’ experience……..I would love to hear from you that the above problems have been eliminated….before I make reservations for this luncheon. Hi Jessica, Thanks for writing in! Were you considering the lunch or the dinner? Both are excellent (and fun as a complement to the exhibition). There is a positive review of the dinner menu (offered Saturday evenings) here: http://www.huffingtonpost.com/jay-weston/paris-life-luxury-exhibit-review_b_873562.html. I’ve enjoyed the lunch and it’s delicious and beautifully presented. Our chef and manager put a great deal of effort into in their food and service, and we certainly hope you enjoy it. Let us know your thoughts if you decide to eat at the Restaurant. Note that our regular Restaurant menu is also served during the show, so you’ll have many choices–and our Cafe will be open, too. Our objective for being at the Getty on this, the last Saturday in July, was to view the Paris: Life & Luxury Exhibit before it leaves us. What a wonderful exhibit it was. We continued our journey into the luxurious lifestyle of the Parisians by going to The Restaurant to enjoy the Paris: Life and Luxury – in Culinary Form lunch. What a delightful culinary adventure it was. The Prix Fixe Lunch of salad, pot pie with truffles and dessert of petits fours along with the accompanying California wines was a true dining experience. The welcoming staff along with the servers were all delightful and so very attentive. Our thanks to Dylan, our server, for making our dining experience at The Restaurant a most memorable occasion The Paris: Life & Luxury Exhibit, the delightful lunch and the great service all made for a wonderful day at the Getty. Thanks! Taste…sunlight with shadow….color bright and dim. 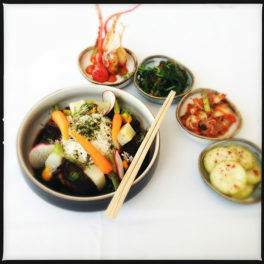 The Getty restaurant, the food….so creative. On a level that is music in the theater of life. Pure…limitless. One day I hope you will accept a gift of coffee and sipping chocolate from our table.